14 students of Universitas Indonesia (UI) Faculty of Engineering that were incorporated in UI Hydros Team created two ship named HeavyWeight Mark III and LightWeight Mark II and succesfully got the Runner-Up title in a world ship contest titled “Hydrocontest 2018” that was held in Saint Tropez, France, September 2nd to 9th 2018. The ship concept was flat plate that is UI ship typical design with monohull semi-trimaran that is design in order to get the good stability and reduce production costs. In long distance race category, UI Hydros Team successfully excel than Swiss, Spain and France team. The first place was grabbed by Southampton team from England. HeavyWeight Mark III was equipped with water tunnel feature that will maximizing water flow for propulsion. A ship with flat plate concept that removing bending process makes the production process easier and cheaper, thus really suitable to be implemented in Indonesia. Moreover, LightWeight Mark II was developed with symmetric catamaran concept that is equipped with hydrofoil. This ship has good stability with the hydrofoil that is expected able to improve the ship speed. This ship also has inverted axebow to break the waves of sea water. The ship was also expected to be able to operate with high level of eficiency. 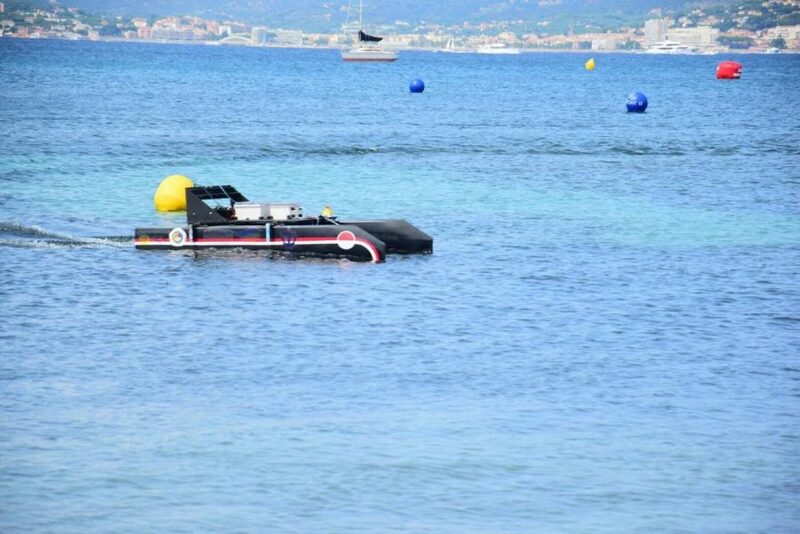 Hydrocontest 2018 was held at one of the best beach in Saint Tropez, Plage des Canebiers. The peak event on the last day was held at an old port in the downtown. The event that was held on September 2nd to 9th 2018 was participated by 28 teams from 15 countries. There were three race categories and seven non-race categories. Each team made 2 ship that is able to compete in all categories, especially race categories. The participated ships consisted of lightweight race that would brought 20kg weights and heavyweight race that would brought 200kg weights. There was also long distance race. Besides successfully took the Runner-Up position, UI Hydros Team was also get into Top 8 of lightweight race and Top 12 heavyweight race. The 14 students of UI that were participated were Mufty Noer Aulia, Vania Juliani Utami, Nabila Alifani, Azizah Nilam Wandira, Bayu Anugerah Pratama, M. Fa’iq, Vidi Wardhana, M. Aziz Murdianto, Naufal Muhadzib Rafif, Alvin Raditya Putra, M. Fuad Syahrudin, M. Akbar, Haekal Dwiputera, Aprian Hidayat and Narenda Putra Dipta.